First, Happy Birthday Shakespeare, you lil' brisle brush o' love. Second, Ziv S., the fabulous Stanford Daily columnist, this hedge is FOR YOU. GO CARDINAL, ZIV and grat submission, Jenny C.! "shakespeare"???? what a great name for a hedgie! where was MY invitation to the party? hmph! I like how he's being held there. "Here is your cake. Look at it, but don't touch it!" Oh.my.god. That is so cute!!! Now I want a hedgehog. And I shall love him, and cuddle him and call him Hans. To eat, or not to eat - that is the question. Oh, that these too, too solid quills would melt! The cutest thing is def. that the hedgie is named Shakespeare. Adorable! Your cake looks so yummy, and you look yummy too. Katrina -- nice! LOL, that's the second "Kiss Me Kate" reference I've seen this week. And Shakespear who loves ya Baby? Happy birthday! that's a lot of cake. 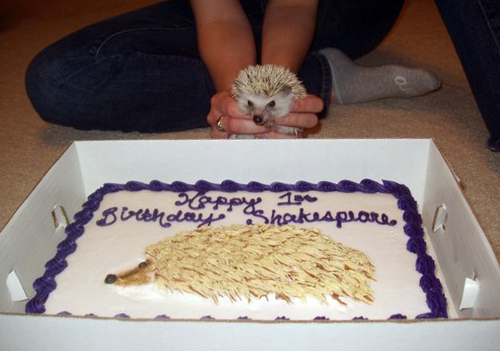 either shakespeare has an army of hedgie friends...or shakespeare's mom & dad were just dying to throw a big par-tay. just after this pic was taken, the kegs were delivered. and why not, with such a sweet reason to celebrate? Banana, I feel your pain. My A.M. is going exactly the same and so I open c.o. and feel such joy at knowing anerable little Shakespeare is having his b-day celebrated. Y to the E to the A! And to all who commented about not wanting to eat your own image on a cake... haven't you ever seen a face cake? You know, where a photo of you is transformed in to something edible and put on the cake? Same idea I guess. I love how HUGE the hedgie is on the cake! Happi birfday Dear Shakespeare, hapi birfday TOOO YOOOOUUU!" Man that is one cute hedgie...how do you function with him around, do you have a job? How can you leave the HOUSE? aw, dat is KEWT. A hedgehog cakie, aw. I'm sure Shakespeare was impressed. I hope there are lots of peeps around to eat that! Wow, I wish I had a birthday cake that was 10 times my size! For some reason I was reading the birthday cake as 'Blueberry Shakespeare' >_>. *requests video of Shakespeare making paw prints in the icing. OMG that cake looks so unbelievably good. I love that when you visit this hedgie's owner's Facebook page, there's a link to Shakespeare the hedgehog's Facebook page. Too cute! Although, should I be depressed that a hedgehog has more friends on Facebook than I do :)? Beautiful! Will we be getting the recipe? (Are those slivered almonds or . . . ?) And Theo--are you a Cole Porter fan?? Sure... Cole Porter, Ginger Baker, Alice Cooper, Jimmy Carter... oh I'm a fan, all right. Wow! The cake is 10 times bigger than the hedgie! Hmmmm!! It's a puzzlement! I cannot answer your question, Theo!! Presumably, they all have something in common---3 of them are musicians and one is a fabulous example of a human being and an ex-Prez, to boot! Shakespeare, the terrified prisoner of hairless bipeds, notes that captors wish him to see that much larger (and two-dimensional)hedgehog has been rendered into some kind of sugary pulp. My very same thoughts, Jen! LOL!! This pic (and the very dignified name) caught me off guard and I can't stop laughing. Super fun! A dish fit for the Gods! Cry "Havoc," and let slip the Hedgehogs of war! So, I'm sure this has been said before, but Shakespeare is an awesome name! As wicked a dew as ere my mother brushed with raven's feather from unwholesome fen drop on you both! A southwest blow on you and blister you all over! Now is the cake full of slugs an worms, or is it a conventionalone? All the world's a cake. Hans My Hedgehog?? Are you kidding me?? I thought I was the only person that had ever seen that! Props to you!! Wow... is this all for me? *starts munching*mmmmmmmm its good! wait you say it's for the party? oops sorry! hope u dont mind a lil hadge spit! You have to see this tiny hedgie! New Rule of Cuteness? The SLOW Blink? I'm Telling You, We Made That Picture! HOW MUCH CAN ONE KITTEH TAKE!? THIS JUST IN: "Jimi welcomes our new kitteh, Scrambles." Kar on New Rule of Cuteness? The SLOW Blink? carlene on I'm Telling You, We Made That Picture! Facebook: C.O. Owns My Soul! Totally Un-Official C.O. Discussion Forum! Receive the daily content of CuteOverload in your email box. Free! Your email address will only be used for this purpose and not given out to any other third party. Did you know you can put a mini CuteTracker on your MySpace page? W00t! Did you know you can add CuteCaps to your own webpage? Try it! If TypePad helps your blog survive a Slashdotting, you know it's strong. Set Up Your Blog For Free with TypePad! If I can do it, you tewtelly can. Don't miss our Press page for ALL pattings on the back!